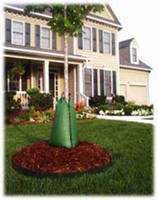 properly and efficiently watering your new trees. trusted by industry professionals worldwide since 1991. Single bag holds approximately 20 gallons. - Single Bag fits 1 to 4 " caliper (dia.) tree. Two bags zipped together holds approx. 50 gallons. - Two bags fits up to 8" caliper (dia.) tree.